In order to study the influence of the physical state of solder on the interfacial reaction of dip-soldered Sn–3.0Ag–0.5Cu/Cu system, two kinds of experiments were designed, including: (1) solid-state aging between the solder and Cu substrate; (2) liquid-state aging between the metastable supercooled liquid-state solder and Cu substrate. 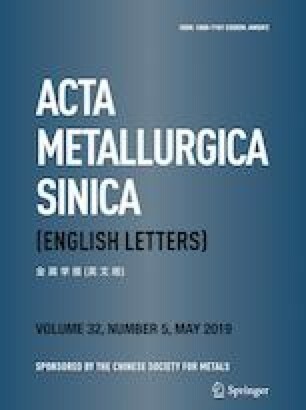 The aging times were 30, 60, 120 and 180 min, respectively, and the aging temperature was 8 °C lower than the melting point of the Sn–3.0Ag–0.5Cu (SAC305) alloy (217 °C). The experimental data revealed that the physical state of the solder obviously affected the formation of the intermetallic compound (IMC), and resulted in the difference in the diffusion of atoms on the interface between the SAC305 solder and Cu substrate. The IMC interface after aging for 30 min presents unique characteristics compared with that of the sample after dip soldering. The IMC interface of solid-state aged SAC305/Cu couple is relatively planar, while the IMC interface under metastable supercooled liquid-state aging conditions presents scallop-like shape. This work was supported financially by the National Natural Science Foundation of China (Nos. 51465039, 51665038 and 51765040) and the Natural Science Foundation of Jiangxi Province (No. 20161BAB206122), the Nature Science Basic Research Plan in Shaanxi Province of China (No. 2016JM5085).